Google business listings are a great way to maximize your presence and allow potential customers to experience your business. This free tool will increase your visibility on Google and help you manage your business across the search engine. In this post, I am going to walk you through the various sections and show you how to complete them. I will also touch on the psychology behind specific features, so you understand why they are essential. Before we begin, please conduct a Google search for businesses like yours. Look carefully at the results. Familiarize yourself with what their listings look like and if they are utilizing all of the features. Take a screenshot of the results for reference later on. We will discuss the importance of this in a few minutes. Have you created or claimed your listing yet? If not please take a minute and create one or follow the steps to claim your business. Mobile users can download the app from the Google Chrome Store. This feature debuted last year and is similar to what you would create on Facebook and other social platforms. Between 100-300 words, you can create offers, promote events, provide a sneak peek behind the scenes, a day in the life of your business, or write microblog posts to engage your audience effectively. Think about how you can give potential customers something of value here. I like to educate them on a specific topic. The more you do this, the better your audience will get to know you and your expertise. Delivering valuable information is how you position yourself as an authority in the marketplace and reinforce your value. Try to avoid over-promotion. The 80/20 rule is always an excellent guide. Share 80% informative and educational content and 20% promotional. Give more than you ask. As we shift more towards a mobile-first world, you will notice that the posts are in card form and optimized for mobile viewing. The jury is still out on whether or not these posts will help your SEO, but anything that gets more eyeballs on your business can help in my opinion. The jury is still out on whether or not these posts will help your SEO, but anything that gets more eyeballs on your business can help in my opinion. You should note that your post will expire after seven days. It will still show on your page but not won’t be prominently displayed when your listing comes up in a search. Input all the details about your business and be specific, especially with the hours of operation and category. You can add more than one. If you have special holiday hours, include them as well. Add your phone number, website URL, and an appointment URL if customers can book time with you online. You can add photos in this tab or choose to later. NOTE: the public can suggest edits on your listing, and these changes may appear without you knowing. Check your listing regularly to make sure the information is accurate. You can always make corrections and submit them for approval. There isn’t anything you need to do here aside from connecting your Google Analytics account, so your results appear on your dashboard. Pay close attention to the numbers on a regular basis. This data will help you make better business decisions based on factual information. You will see how many unique visitors, page views, and new visits you had in a specific period. We are transitioning into a data-driven world, and these insights help us understand what actions our potential customers are taking on our page, how they found us, and how we stack up against our competitors. If you perform a search for your type of business in your target area on maps, you will see a list of your competitors. Click on each listing and see how you compare. Look at the completeness of their page. How many photos and video did they add? Are they utilizing the posts feature? Do they have any reviews? If so, are they publicly responding to them? By completing every inch of your page and taking advantage of all the available features, you will already be ahead of many other businesses in your area. I know this because I have searched for thousands of companies and was amazed to find how many are not. Feedback is there for a reason. It tells us what is and isn’t working in our business. I know it can hurt when we hear negative feedback, but this is an opportunity to turn things around and possibly create a relationship that leads to more business and referrals. Ask people who have experienced your product or service. Craft an email. Ask your customer if they would take a minute and write a testimonial about their experience with you. This next step is critical. 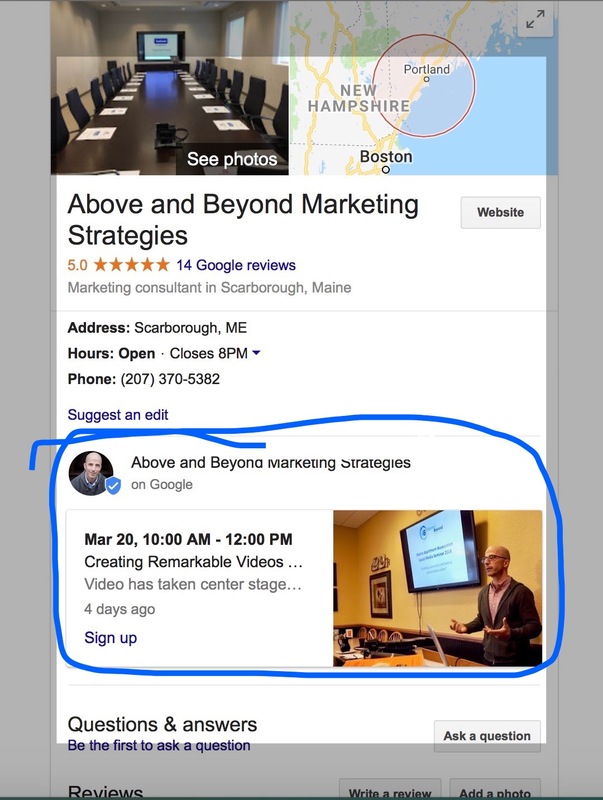 Include the link to your Google Business page (and any others you want a review on). You are making it easy for them to write the review. The more comfortable, the better. You won’t solicit all reviews. Random users can leave one any time they like. I find that most people write an unsolicited review when they have had a bad experience or an amazing one. Some people think that too many five-star reviews will negatively affect you. I disagree. Anybody who takes the time to read yours can usually tell whether they are real or not. If you provide exceptional service, you deserve a five-star review. Every time a review shows up, publicly respond and thank each person who left one. This action shows you value what they have to say and others will see that you care about your customers. Remember, we want to build a word-of-mouth business and reviews are one of the best ways to do this. You are making a relationship with your customers, and this process sets the stage. Your happiest customers are your best customers. Make them feel special. Check out the 2018 Customer Service Benchmark Report from Super Office to see some eye-opening statistics. So, how can you provide exceptional customer service all of the time? Respond to everyone quickly with a relationship building mindset. If you get a negative review from a customer, don’t immediately take the offense. Sit with it for awhile before responding to them. I learned the hard way in my early days by reacting rather than responding, and it never goes well. This feature is a game changer for customer service. A customer can message you directly from your listing on a Google search. All you have to do is turn the feature on, add your phone number, and customize a greeting. 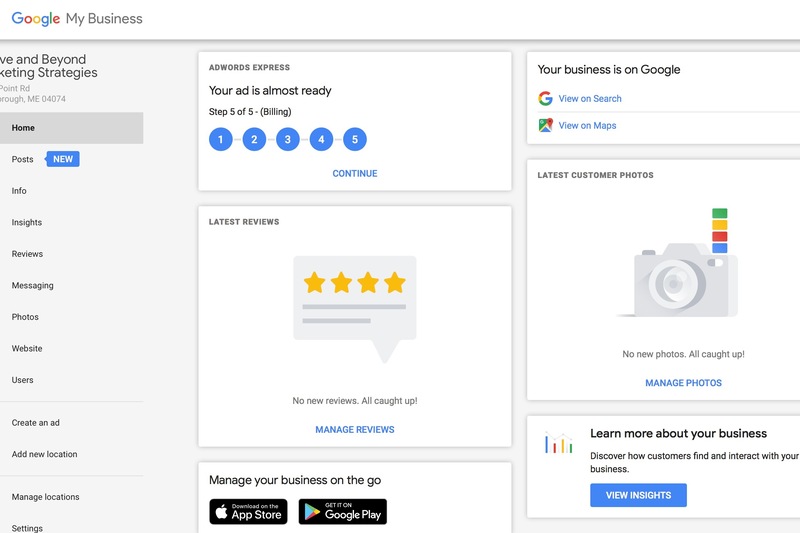 Similar to the Facebook messenger, Google will calculate your response time, and it will show in your listing. If you answer quickly, you are more likely to receive a message from them. If you take a day or more guess what happens? The majority of them will probably look for someone who will get back to them faster. People want answers, and they want them quickly. In today’s world, we expect everything fast! First, add your logo, a cover image, and profile photo. They will also show on your Google+ profile. Compile some of your best at work or behind the scenes images to give customers a taste of what it is like to be you and do what you do. If you sell a product, demonstrate it through video. Produce video tips or updates to educate the consumer. Remember that our goal is to be an authority in the marketplace. I recommend putting as many photos and videos as you can but make sure they are a good representation of your business. By humanizing your listing and engaging with people you are making it easy for them to relate and get to know you. When people are comfortable, they make better decisions. Google offers you a free template website at no charge. It’s more like a web page and consists of the images and information you plugged into your listing. If you don’t have the resources and budget for a professionally designed website, then this might be a good option for you. Create ads quickly with this feature. Google will walk you through the process. If you don’t have much experience with Adwords and how they work, do some research before creating your first ad. Check out the Keyword Planning Tool in your ad account and learn how to choose the best keywords and phrases for your ads. We covered the various features and why they are essential. Google is the most significant search engine on the planet and isn’t going anywhere anytime soon. Even if this isn’t a game changer for your SEO, it shows potential customers that you have your hand on the pulse of your business and care. That is indicative of how you run your business. What you learned here today applies to your website and social media accounts as well. If people like what they see in one place they will click through to your website and other profiles. We never know where our next customer is going to find us.